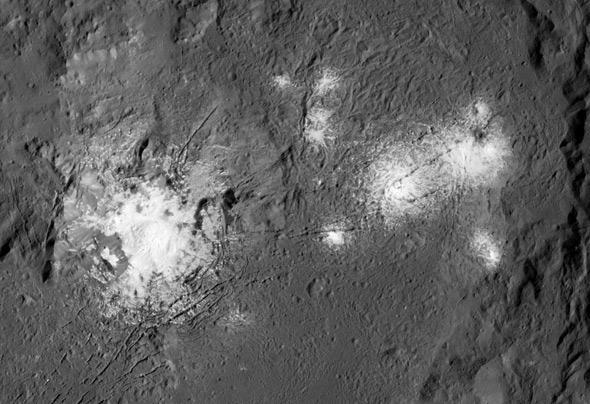 Super hi-res image of Ceres crater Occator shows detail in bright spots. Sweet mother of protoplanetary briny impacts! I’ve been wanting to see a high-resolution image of the crater Occator and its weird bright spots for months, but I never expected this. High-resolution mosaic of the 90-kilometer-wide crater Occator on Ceres. Click to endemeterenate because yes, a much bigger version is available. Mind you, that’s not the full picture, nor is it full size here! I had to crop and shrink it; the original is 7,700 pixels on a side and will melt your brain. I recently wrote about Occator and the odd ridgelike features running down its rim. I’m not sure what they are (though I have an idea; see the link), but this is definitely the best view of them yet. Yegads. Like most craters on Ceres, the rim wall has suffered a series of landslides, and the debris has piled up all around the crater wall floor. The bright spots up close and personal. And the bright spots! 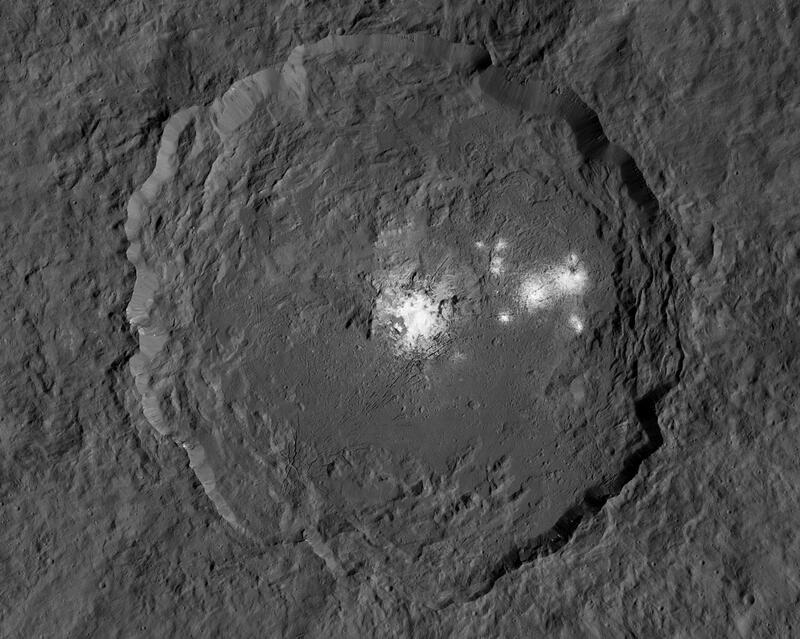 Those were first seen when the Dawn spacecraft was still nearly 400,000 kilometers from Ceres back in January 2015, and hinted at in Hubble images before that. It took a while, but planetary scientists seem swayed that the spots are salt deposits. 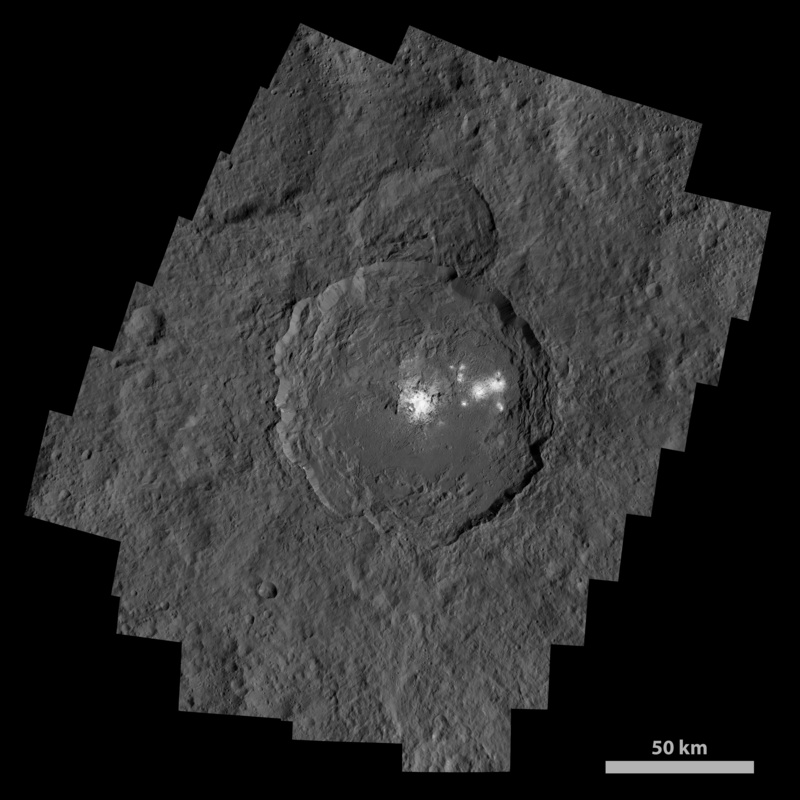 Ceres has a lot of water ice in it as well as a lot of rock, and under some circumstances when those two substances interact you can get salty water. Ceres probably has a mantle of water ice under its crust, and that can make its way up to the surface (though the exact mechanism, or, more likely, mechanisms, is still being argued over). Ceres has no atmosphere, so direct sunlight can cause the ice to turn directly into a gas in a process called sublimation. If the water is briny, it leaves the salt deposit behind. As you can see, Occator (which is roughly 90 kilometers wide) has a lot of those bright spots. The floor is also cracked, with many of the cracks running parallel. Interestingly, they don’t seem to come from the central peak so much as from what looks like a small dome to the lower left. Perhaps there was some upwelling under the surface there that caused the crater floor to rise and crack. Even in the very high-resolution image I see very few craters inside Occator, implying a relative youth to it. According to Dawn team member (and Dawn Journal author) Marc Rayman, Occator is probably about 80 million years old. That’s very young! Ceres formed 4.5 billion years ago, so geologically Occator is pretty new. If you like this sort of thing, you should absolutely read the Dawn Journal, by the way. It’s a wonderful resource about the mission and its target worlds Vesta and Ceres, written in a very approachable and even fun way. Anyway, do yourself a favor and grab that hi-res shot and simply scan over it. Boggle at the detail, the sheer desolate beauty of an airless almost-planet that was nothing but a dot of light in our night sky for centuries until we took up the challenge of actually going there. Never forget that this is what humans do when we band together and let our curiosity drive us. Science takes us to other worlds, so that we may gaze upon them and marvel at what they are.